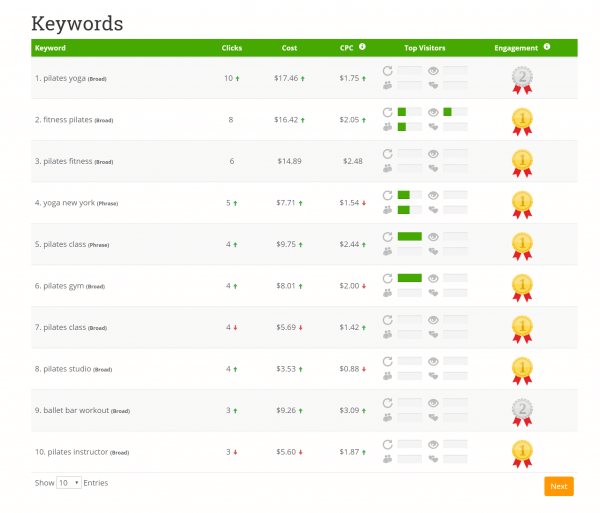 Which of my keywords are being searched the most in Google? Which keywords bring more/less engaged visitors? 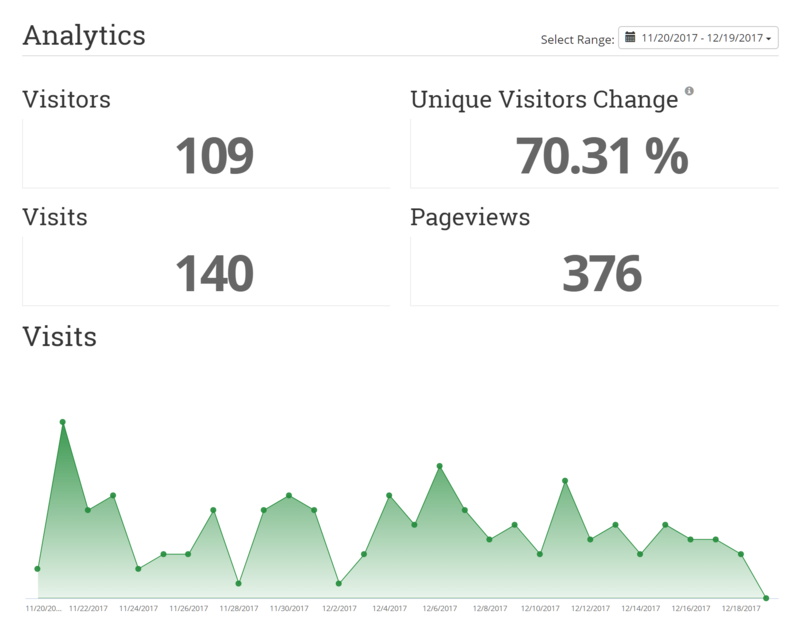 How long are visitors staying on my website? 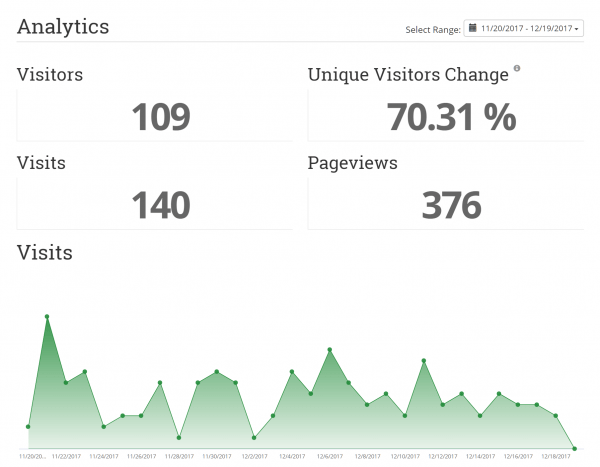 How many pages do visitors view while on my site? What page do people stay on the longest? 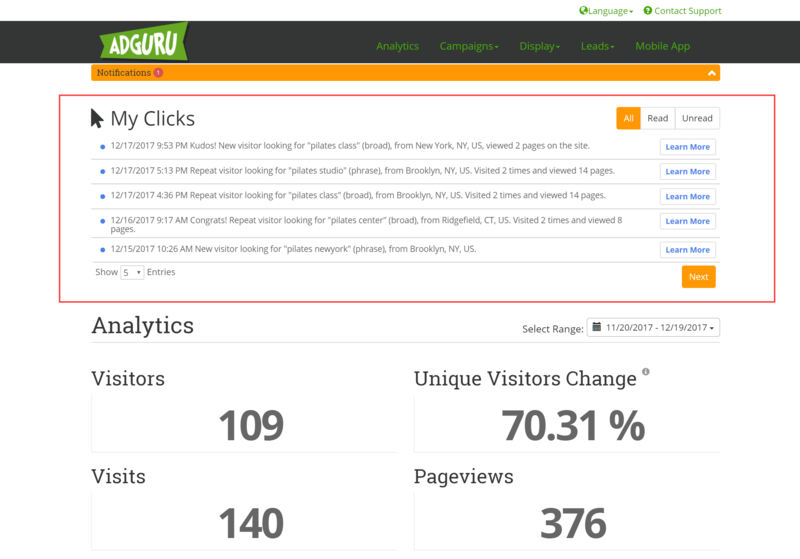 Log into the AdGuru dashboard and select Analytics from the navigation menu. At the top of the page, you’ll see latest insights regarding visitor behaviour and campaign performance. Click Learn More to review the information and associated recommendations to further optimise your campaign. Below, you’ll see summary of key site analytics, including Visitors, Visits, Page Views and more. You can change the date range reported by clicking the drop-down menu at the top right of the Analytics section. As you continue to scroll down the page, the insights presented become more detailed. Visitor statistics include the number, average visit duration, a breakdown of visitor types including Repeat Visitors, Prospects, Fans and Researchers (Intelligently classed based on behaviour on the site) and an Engagement rating. The Engagement column medals to depict visitors’ level of engagement when they enter your site. A gold medal is the highest level of engagement, meaning a visitor who searched that keyword in Google was more engaged in your site than others. A bronze medal shows a user that was less engaged in your site than others. To find out more about the insights generated, simply hover over an entry and definitions will be displayed on screen. Click on a campaign to drill down into a specific report. As before, you can use the date range drop-down menu to adjust the reporting period. 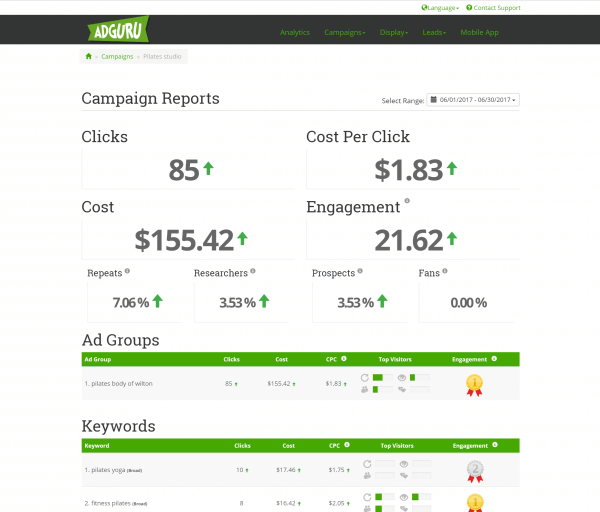 Summary information, at the top of the page, includes the number of clicks received during the period, the cost per click (CPC), total cost and engagement level. Arrows adjacent to each stat show the trend movement. The Keyword section of the report allows you to analyse specific keyword performance. Statistics can be used in combination to identify optimisation opportunities. For example, if a keyword has a lower engagement medal, and a higher CPC, it may be idea to pause that keyword. Low engagement at high cost simply doesn’t make good business sense. These visitors are not as engaged as they could be, and you’re spending a little more for each click. If a keyword has a lot of clicks, a gold engagement medal, and high top visitor numbers, then that may be a good area of focus for your business. Consider focusing that keyword on the landing page to which our ads are being directed (boosting search engine position), or running promotions on the product or service around which that keyword revolves. Again, hover over each entry to read an explanation or view additional insights. The Landing Page section of the report displays the most popular entry pages for your site. Typically, your Home Page will top the list, but be sure to check the engagement levels and visitor statistics for your site’s About page. Again, combine the data presented to generate insights. For example, A landing page with a high average duration, high visitor count, and high engagement could help you identify a valuable opportunity to display important information, activate promotional activity or embed calls to action. 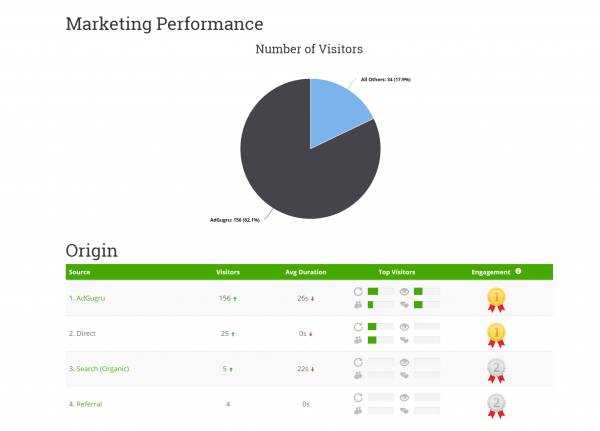 The Marketing Performance and Origin reports are useful for comparing how AdGuru generated visitors compare to other sources, such as organic search results, referrals from other websites and more. Click on an entry to drill down to deeper insights.